It has been estimated the orthotic industry is worth $3.5-4 billion annually! So many people try and fix their “flat feet” by getting over the counter and custom orthotics to move their foot to the desirable position. Compliance with wearing these orthotics is low because of the pain of having the foot forced into a position and the tensions that external force produces up the leg. What if I told you, that you don’t have flat feet but actually too high of arches that caused your foot to compensate? I have only seen a few rare cases where someone had a true flat foot and it was always from an accident of falling from a height and compressing the foot or from something falling on the foot. To this point, it has always been a trauma and external force that made the arch collapse. What we often see is the appearance of a flat foot but when we place the back of the foot, or rearfoot, into a neutral, vertical alignment then the inside of the foot comes off the ground. 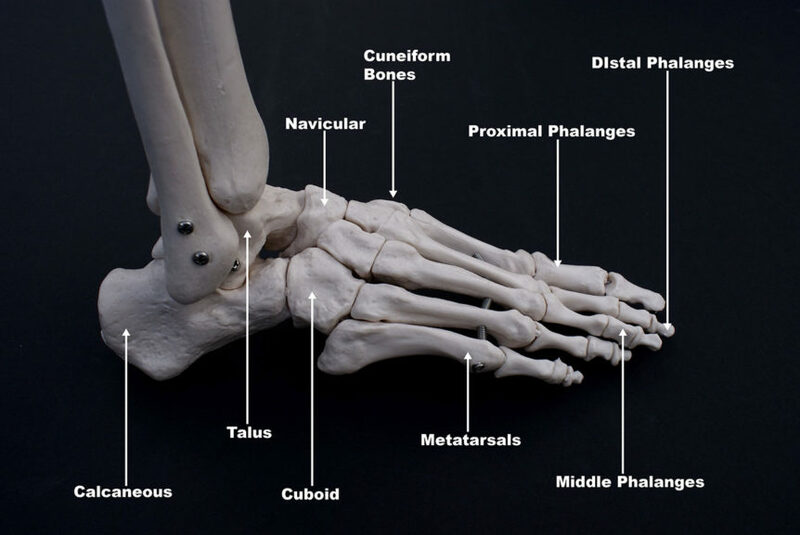 The midfoot made up of the 3 cuneiforms, cuboid and navicular are stuck in an elevated position and cannot relax down. There are tons of sensory and proprioceptive nerves in the foot, especially the big toe. Your brain needs the feedback from these sensory pathways to keep you balanced. If the midfoot is restricted and the arch is too high, then the rearfoot will collapse inwards to allow the plantar surface of the foot to have full contact to the ground. You can see if you have this if you look at the alignment of the Achilles tendon down the back of your leg. In the efficient state, the tendon will be perpendicular to the ground all the way up the leg. We use soft tissue and joint mobilization techniques to correct the rearfoot and midfoot alignment. It would not be effective to work on just one area so we must treat the whole foot and ankle complex. Strengthening exercises of the intrinsic muscles of the foot are crucial for maintaining the alignment changes achieved through the manual therapy techniques. Your entire body weight is put through your foot with every step. If we work on just the alignment but not re-educate the muscles how to stabilize and maintain the new position then it will fall back into its old compensations. So why do orthotics not work with flat feet? When the foot is mobilized and strengthened into efficient alignment, there is a natural springiness restored to the tissues where they absorb the force and transfer it back through the floor with spring. The ground reaction forces are effectively distributed. If you put a rigid foot in an orthotic and superimpose the proper alignment on the foot, it will not have the give in the tissues. The forces are not distributed evenly and increased force is put through the foot and up the leg which can lead to injury. People with more dysfunctional feet have a lower compliance with inserts and orthotics because of these abnormal forces causing pain. Change your mindset on your “flat feet” and think twice before you spend another $800+ on a custom set of orthotics that will most likely end up at the back of your closet. Look for improving the natural alignment of the foot for a long lasting effect that will be translated up the leg and into the body.